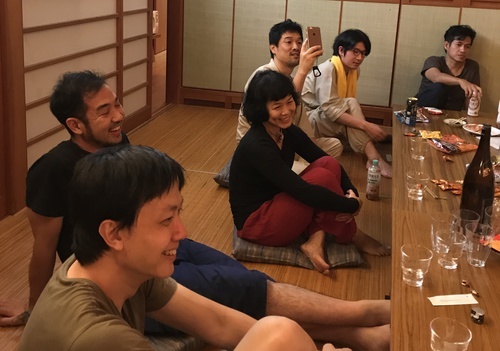 During September 16 - 18, 2017, members of the Asian Meeting Festival (AMF) stopped by Amino-machi in Kyoto prefecture between their concerts in Fukuoka and Kyoto City. The reason for their detour was to participate in world-renowned sound artist Akio Suzuki's Otodate tour. Otodate is a guided tour where participants visit listening points discovered by Akio and listen. This Otodate tour was titled "Akinyan's Tango sacred location tour ACT x AMF2017." "Akinyan" is Akio's nickname. This tour was organized as one of the programs for Art Camp Tango (ACT)'s "ART CAMP TANGO 2017, listening, seeing, being there." 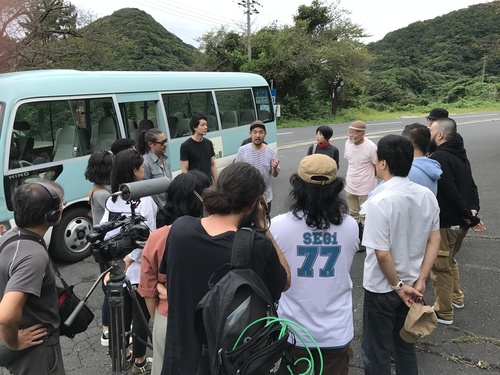 However unlike the other programs of ACT that took place in September, this Otodate tour was not open to the public and only for AMF musicians and a few others.The tour was schedule during the day and the evening were left open for everyone to relax in the hot springs. ACT is an organization initiated in 2013 by Akio, contemporary dancer Hiromi Miyakita, and guitarist Akinori Yamazaki all living in Tango. Focusing on artistic creations centered around sound, they have invited genre-crossing artists from sound art, contemporary art, music, and dance to Tango and have organized exhibitions, concerts and performances. 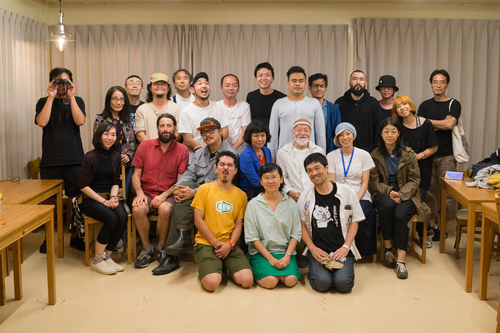 For "ART CAMP TANGO 2017, listening, seeing, being there" Fiona Lee from Hong Kong, who had participated in 2016's edition of AMF, and Makoto Oshiro from Japan stayed in Tango to make new work exhibited during the program period of September 9 -24, 2017. Many more artists came and participated in various programs. 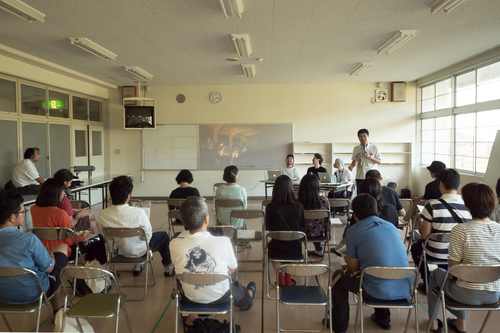 More details about the program can be seen on their website:http://www.artcamptango.jp. The AMF members arrived in the evening of the 16th and participated in the Otodate tour on the 17th and 18th, visiting four locations including a cliff on the coast, a mountain, beach, and tunnel. They later gave a feedback presentation at the former Kyugo Elementary School and a simple concert. On the 19th they returned to Kyoto City to play a concert at METRO. ACT asked me to host the feedback presentation, so I joined the AMF members from Kyoto Station on the 16th, and took part in the Otodate tour, the nightly after-parties, and hot spring dipping. I also watched the concert at METRO and even crashed after-party for that too. For me these three nights and four days was too fun to call work, so at least I want to leave a record on what happened during these four days and have it to be of some use. This is a document of the meeting between Akio Suzuki, who is widely consider to be the first person to present the idea of sound art through the act of listening, and AMF, which has been presenting the most exciting platforms for improvised music in the last couple of years. How did a person who listens and person who plays meet and interact? Members of AMF arrived to Kyoto Station Hachijou Exit around noon, and took a bus arranged by hot spring lodge "Ukawa Onsen Yoshino-No-Sato." The Otodate tour began the next day so that evening everyone enjoyed bbq dinner prepared by the inn. At dinner, Akio told me that he doesn't like to go to hospitals. He continued to tell me: "One time, because I didn't go to the hospital and I got so sick that I felt like I was going to die, in my delirious state, I had arrived to a mysterious building on top of a mountain with a bell. There I heard a wonderful sound that I had never heard before and I thought I have to tell my friend Hiroshi Yoshimura about this." This story left a strong impression on me and made me think on how he must have really dedicated his life to listening. 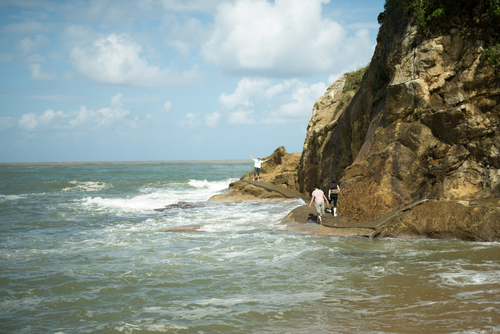 We first headed to Kyogamisaki and its sheer cliff shore. 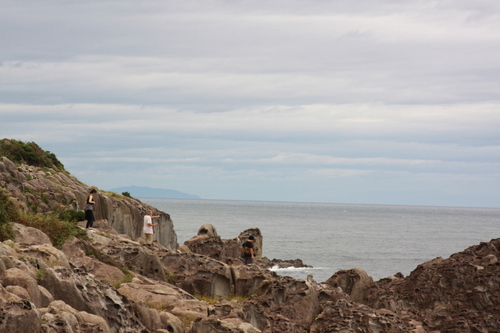 In the Akio's leaflet it said: "The rocks here were used to make the lighthouse in 1898. This is one of the most beautiful among the many Kyoto sceneries. I have recorded a performance here twice in the past. Beware of the wild monkeys who have acquired a taste for uni (sea urchin)." Fortunately, we did not encounter any wild monkeys because of the approaching typhoon. The Kyogamisaki Lighthouse seems to be a tourist attraction, but our destination was the rock cliff beneath it. We got off the bus where the road split between going to the lighthouse and cliff, then walked a path up and over a mountain. Akio who was born in 1941 therefore 76 years old, was the best hiker among us, and I was surprised to see he climb the hill with ease going far ahead of us. After for what felt like an hour's walk, suddenly an open space facing the sky and ocean emerged. From there, was a path leading down the cliff, and we finally arrived to our location. It was a rocky area, landscaped by boulders in the shape of pillars with many corners. According to the website of Tango, （http://www.pref.kyoto.jp/tango/tango-doboku/miryoku_kyougamisaki.html）, when Kyogamisaki is seen from a distance: "The basalt cliff stands at such a steep angle that it looks like Buddhist sutra book. The namesake of this location is said to be that fishermen would recite sutras for their safety at sea when they passed by." The polygon pillar-shaped boulders look like they could be man-made but are shaped naturally and are called columnar joints. We could hear the sound of the wind blowing from the sea through the rocks, and the waves hitting the cliff. The sound of the wind reflected in all directions giving an impression of a closed space, but at the same time because we faced the ocean with the mountain to our backs it could be also felt to blow outwards to the sky and ocean, giving an impression of openness. The musicians of AMF wondered around and sat in various places to listen. Then gathered again to listen to Akio talk. The picture published in The WIRE Magazine issue 406 (https://www.thewire.co.uk/issues/406) was of this moment taken by musicologist David Novak who had also joined the tour. I was so tired from the walk that when I saw something moving in one of the puddles I shouted out loud that they were sea horses but it turned out to be mosquito larva. I felt very ashamed and not worthy of my academic credentials. Next we headed to Inagosan's Meike (Woman's Lake), which is the origin for Tango's Hagoromo Densetsu (Legend of the Robe of Feathers). The legend tells a story of a man who was taken by the beauty of a Tenyo (heavenly maiden) bathing in the lake and stole her hagoromo so that she cannot return to heaven. In Akio's leaflet it says: "The mythical lake where the Tenyo bathed. In 2002, I threw in a stone from Tango's Nogahama beach into this sacred lake to record sound for a gallery exhibition in Kyoto. 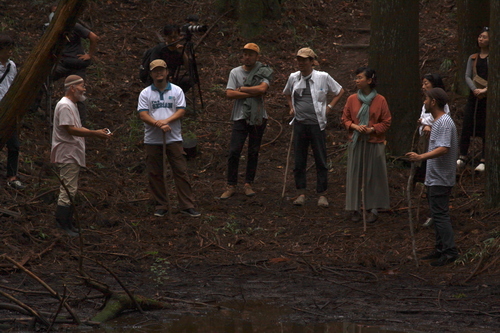 In the future when they do the Ikezarae (a ritual to clean the lake), I hope I can take part to retrieve this stone." We took the bus to a location called Hagoromo Chaya, and from there Akio led the group up the mountain again with his impressive stride. Meike was located just below the summit in a naturally sunken area. The water level has decreased over the last decades and now has shrunken to about 50cm deep and 10m in diameter, looking more like a swamp or a large water puddle. At the beginning, I was listening more to the sounds of footsteps on dry leaves and birds in the trees rather than the sound of the lake, but as Akio explained the folklore and how it represents the transmission of agricultural knowledge into the Japan, my imagination was triggered. An image of Akio throwing a stone into the lake and ripples first spreading in the water but gradually sounding outward towards and beyond the mountains filled my head. Maybe this is just a fantasy but that's how I listened. I wonder how the AMF musicians were listening. On the way back to the inn, we stopped by Onojin Miso and Shoyu Brewery（http://shop.kyotodays.jp/fs/kyotoseikatsu/c/114/）. There we received the news that the typhoon may hit Amino. Afterwards we stopped by the supermarket to source drinks and snacks for the party later, and by that time the rain and wind was very strong. Dinner was crab hotpot. Akio and Hiromi left early because the storm was getting stronger. In hindsight this was a good decision. That night Typhoon No.18 hit the larger Kinki area and most of Amino was flooded later in the evening. If they had stayed with us any longer they would have not been able to return. During the hotpot there was a moment that felt very musical. After about an hour into our meal around 8pm, the storm was intensifying. Then suddenly the lights in the room went out. The staff at the inn immediately brought flashlights but none of the musicians seemed to be bothered by this and continued to eat their crab. I was very impressed. They were all seasoned improvisers that could adapt to the any kind of situation. Even a blackout in a foreign country during a storm, didn't break their concentration on eating the hotpot or to converse with each other. The interplay they show us on stage was carried on even when they didn't have their instruments. The next morning the typhoon had passed. After breakfast, Thuy from Hanoi told me that because her city is small and you can hear some kind of sound wherever you are, and she has never experienced a quite place like Tango. The soundscape of every country is different so it must be interesting to be taken to so many local sights on Akio's Otodate tour. As I was talking to Thuy, I realized that I didn't know the reason why the AMF musicians were in Tango enjoying this listening tour. Although our inn was on a hill and we were safe, other residences were in lower parts near the ocean, and many had flooded. A road near by was destroyed and parts of the ocean that we can see from the inn and on the bus had changed its color to brown. However, the sky was clear and we continued on to day two of the tour. In morning we headed to a former gambling den in Takano fishing village in Tango. Akio's leaflet states the following: "A large cave that is located behind a cliff on the beach. As the name suggests, it used to be a secret place. During the winter, the sound of the strong waves hitting the rocks makes for a perfect daily practicing space for instruments such as the Japanese flute." According to Akio this used to be where people gambled illegally. He described how interior of the cave becomes a beautiful blue with the reflection of light. Under normal weather conditions going to the cave wouldn't be a problem but because it was after the typhoon and tide was high the path to the cave was covered with water and we couldn't reach it. Thet, Alice, and myself made it close to the cave, but we had to return to the beach without actually seeing it. As we got close to the cliff it was fun to hear the waves hit against the rocks, but if the tide had become higher we probably wouldn't have been able to return to the beach. Some members behind us were hit by the waves, and when we returned several of them were soaked. We had to make detour to return to the inn and change our clothes. Our next destination was a tunnel. 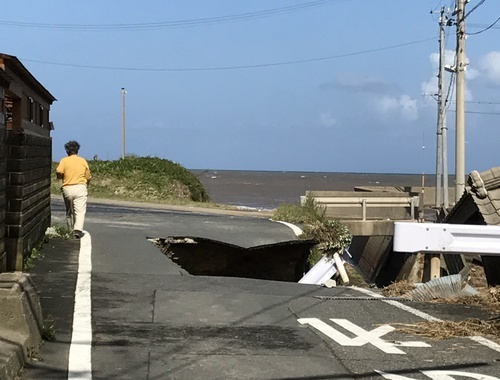 Not even a tourist destination, this was a normal tunnel that spanned for about 1 km between Tango junior high school and Sumihei Taiza hot springs. In Akio's leaflet it says, "In this long S-shaped tunnel, I poured water from five buckets and recorded the sound of water splashing when cars passed by for my exhibition at DAAD Gallery Berlin in 2000." 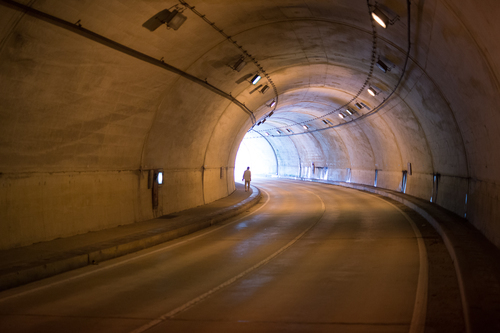 True enough, rather than being straight, its S-shape was an obvious feature of this tunnel but there must be many tunnels like this in the world. This seemed to be a normal tunnel in every way. To my surprise the listening experience in this tunnel was mind-blowing. We walked about 100m into the tunnel, and we stood at a point where we could not see the entrance anymore because of its shape and listened to the cars pass by. 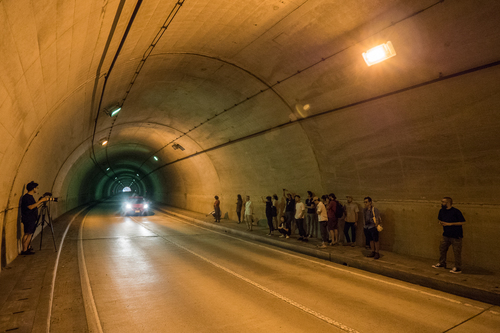 Several cars passed, slowing down at first being surprised by the 20 pedestrians in the tunnel but then accelerating again after judging that it was safe. We could hear the car's engine sound with a Doppler effect, the sound of tires against the road, and the reflection of these sounds. Small sounds grew louder as they approached and eventually disappeared after they passed. This process of sound passing was so powerful and dynamic. We were all overwhelmed. Akio poured water on to the road and recorded the sound of the splashing caused by the cars passing. We can see in this the consistent philosophy in Akio's work of "throwing and following." His works is based on "Nagekake" (to throw) something into a situation and observing or "tadori" (to follow) the change that occurs. The foundation of Akio's work is an endless desire to listen. This is why he is considered to be the first artist to propose the act of listening as sound art. In this tunnel we did tadori to the sounds that came. The person who responded to this experience in the tunnel the most was Alice who performs with just her voice. Without any discussion with Akio or the other musicians she started to make her own voice performance in the tunnel with many different tones. 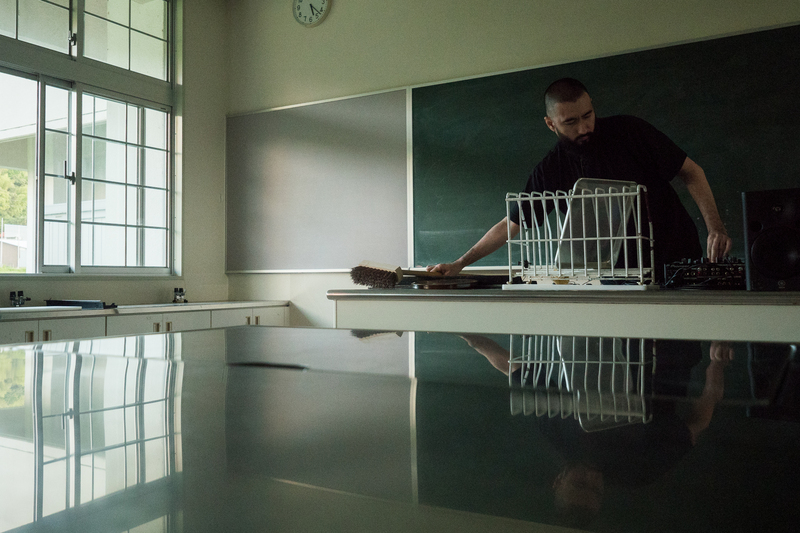 By moving around and facing different direction to explore the change of how the sound reflects, it seemed as if Alice was unconsciously reenacting Akio's "Self-Study Events" from the 60's where he recorded how sounds reflect in different spaces through his "Nagakake-to-Tadori." Thuy was also very touched by this location and asked Akio if he could conduct an Otodate tour for her colleagues in Vietnam and in Sweden where she resides. Afterward we moved on to Kyugo Elementary School to do the feedback presentation and an impromptu concert by the musicians. At the feedback presentation the activities of ACT and AMF were introduced and how this project was organized. This was first time where the aim of this projects was explained by the artist themselves. For ACT this was part of their founding mission - to invite artists to work in Tango. Inviting AMF was like a short artist-in-residency project. For AMF this was a opportunity to deepen the relationship between the artists invited from various countries of Asia and also to give them a break from their intense concert tour. Initially dj sniff, Chee Wai, and Tamura from the AMF production office came to visit Amino to see if they can organize a concert. However, it seemed difficult to organized a large group improvisation or free music concert in Amino, so they decided to work with ACT's artist-in-residence initiative and asked them to organize this Otodate tour for just AMF members. I hosted this feedback presentation but was helped at length by dj sniff, Chee Wai and Hiromi. I remember asking Akio what it felt like to bring the AMF musicians on the Otodate tour. He answered very charmingly: "It's like bringing a lover to all your favorite places." After the talk, several musician played a concert. This was the first time I heard the AMF musicians play and it was very fun. First, Kaho played solo in the hallway. 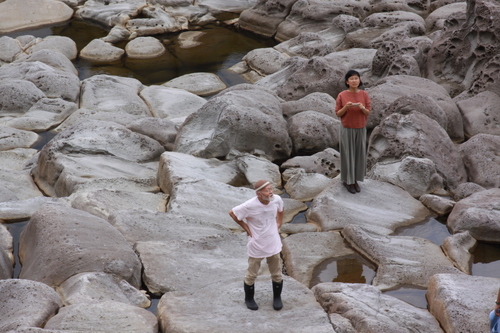 A virtuoso on Chinese flute, he stood on top of pebbles gathered from outside and played the flute together with the sound of stepping on rocks. Then Thuy walked down with the hallway carrying her instrument đan tranh and the two played with incredible precision. After their set, Thuy led the audience to a classroom where she played part of her composition holding her interment vertically and inserting forks and other object in a prepared instrument fashion. Caliph8 collected various objects left in the former elementary school and built his own custom instrument, which he extracted sounds with a contact microphone and shaped into rhythms with his DJ mixer. His setup with devices laid out on the table reminded me of some sort of scientific experiment. After this Spencer (voice, violin), Chee Wai (aluminum foil, bow, and voice), and Alice (voice) played together in a classroom that had Tomohiko Ogawa's work on display. Their improvisation, which featured high-pitched singing from each of them, Spencer's violin, Chee Wai's aluminum foil and Alice's growling, was very seductive. The last was Akio playing his self-made instrument Analapos in the room that had Soichiro Mihara's work "Study of Air" displayed. Mihara's enlightening work collects the airflow from the elementary schools clock tower and visualizes it through a floating plastic tape. I wondered what Akio was listening to when he was making sounds on the Analapos. This is my record of AMF visiting ACT, and ACT welcoming AMF. From the outside, it's hard to tell how the experience in Tango may have influenced the playing at AMF. Although it must have been stimulating for the "people who play" at AMF interact with Akio the "person who listens." I imagine that they made connections between playing and listening or felt that to listen is to perform. For me the true pleasure of group improvisation is when I witness musicians who don't share a musical language try to work together and something that has never been heard of is born out of it. It feels similar to when people from different countries meet for the first time and try to have a constructive conversation without being too concerned with each of their nationalities or culture. Whenever I see a performance at AMF I am very touched because I always feel that they are presenting the joy in communicating with someone you don't know. When we communicate we cannot just talk but also have to listen to others. Perhaps the listening experience in Tango would help "the people who play" communicate more smoothly with each other. On the other hand, what was AMF for ACT? Of course their presence fit their mission to host an artist-in-residence, but what specific meaning it had more than that is something that I can't know from the outside. However, to end this long report I want so share one story. 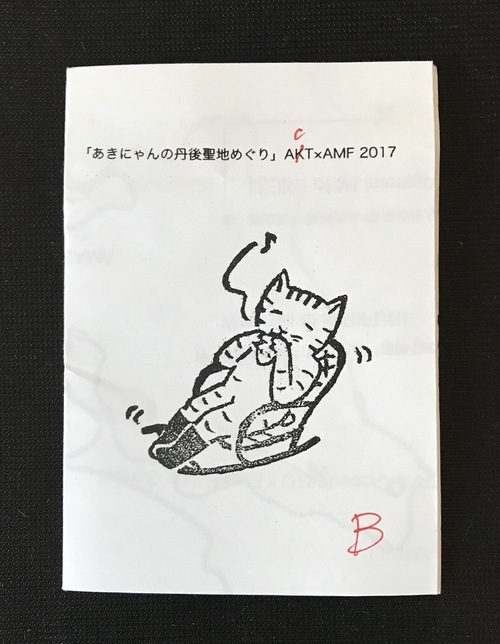 During November 2017 as winter was arriving, an article about AMF ran in The Wire and around the same time news came that Akio's work "A Place in the Sun" was destroyed before celebrated it's 30th anniversary.（https://www.thewire.co.uk/news/49047/akio-suzuki-s-space-in-the-sun-has-been-demolished）。"A Place in the Sun" is a performance and location that Akio made in 1988 without an audience. One day, he thought that he would like to listen to the mountain all day, so he prepared for one year baking bricks and bringing them up the mountain to build a wall and platform for him to listen. Once completed, from morning to sunset he sat and listening to the sounds of Amino's mountains for the whole day. The brick structure that was left became "A Place in the Sun" but recently a grazing cow had its foot caught among the bricks and died. The manager of the farm was angered by this incident and decided to demolish Akio's work. Regardless of the validity of this action, the fact that one of the most prominent sound artworks for the act of listening was destroyed had deeply saddened Akio. However, when I had a chance to talk to Akio in December he told me "it feels like the spell was broken" and mentioned that it might be a good chance to move to another place. I was very surprised by Akio such positive outlook. I don't know how serious he is about this but I was impressed by his drive to move forward even at his age. This led me to think that although I am not sure what AMF musicians brought to ACT, but unless they are careful they will be the ones left behind by ACT and Akio going far ahead of them like at the various locations on the Otodate tour. Nevertheless, I look forward to the future activities of both AMF and ACT. Born 1975. Currently associate professor at Yokohama National University Urban Innovation. Specializes in audio culture studies, research on sound art and theory of sound media. He writes papers and teaches. He attained his PhD in Kyoto. 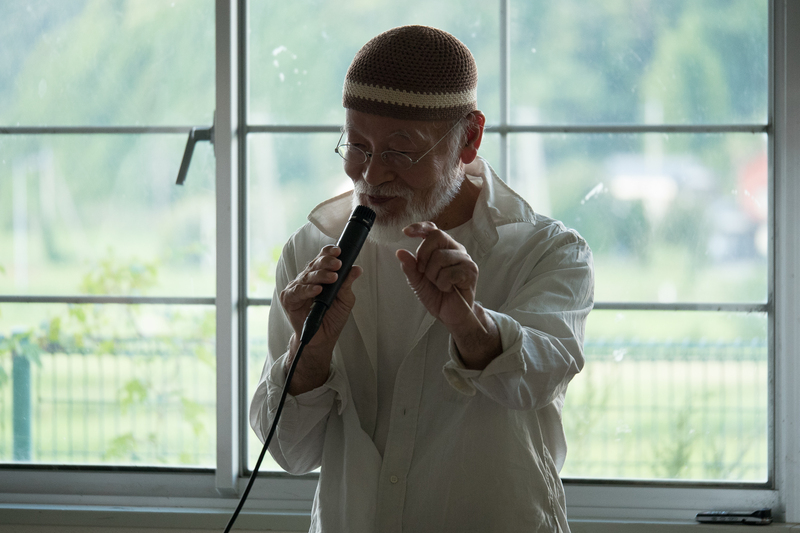 Recently he is focusing on the history of sound in Asian and Japan.